A friend told me she planned a fancy affair. I wasn’t sure I heard her correctly. 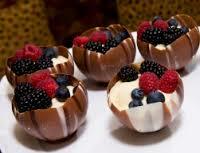 She did indeed, mean chocolate bowls. Rather than go through the process, I’ll direct you to these two websites. Great idea for a really special party. Fill them with fruit for a special treat.